The strong sister of the European group, but for how long. Berlin seems happy to validate Trump’s spending criticism. German politicians love to heap scorn on President Trump, but then they shouldn’t try so hard to prove him right. Witness this week’s Berlin backslide on military spending. The budget now under discussion in Berlin foresees defense-spending increases until 2020 but declines after that, both in euros and as a share of GDP. Military spending would max out at €45.1 billion next year, or 1.37% of economic output, before falling to €44.3 billion by 2022. Defense spending hit 1.3% of GDP this year. On this course Berlin won’t make even its “political goal” of 1.5% of GDP for defense, never mind the 2% target for each NATO member to which Germany has repeatedly committed. Berlin can afford to boost military spending, since the overall budget is increasing by nearly 2% and revenues are expected to increase modestly up to 2023 despite slowing economic growth and some small tax cuts. The government simply chooses not to. Social spending will rise alongside the sort of public-works “investment” (such as €5 billion for computers in schools and €3 billion for artificial intelligence R&D) that the scolds at the International Monetary Fund demand. Berlin usually argues, as Chancellor Angela Merkel did again Tuesday, that no one should take these estimates too seriously because Germany always comes up with more money in the end. 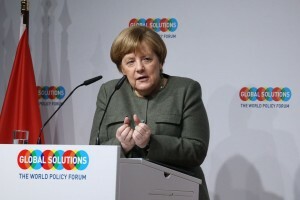 Mrs. Merkel also conflates defense spending with foreign aid, which will increase by €5.1 billion between 2020 and 2023. Berlin claims it should get credit for its aid budget on the theory that it boosts global security or something. But foreign aid won’t stop Russian tanks, and it doesn’t excuse Berlin’s breach of pledges to its allies. This will also embolden Mr. Trump and others in Washington who argue that German defense failures are a reason to rethink U.S. commitments to Europe. "It's much much better to talk to one another than about one another"